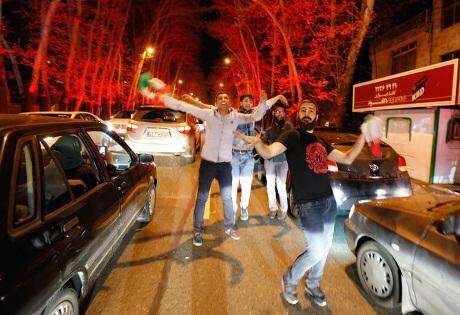 Jubilation in the streets of Tehran after news of the deal which means sanctions will be lifted. EPA/Abedin Taherkenareh. 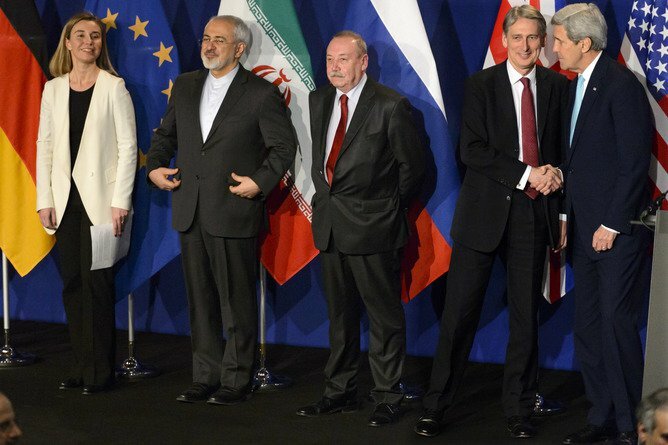 Finally, after years of diplomacy and brinkmanship, the long-awaited nuclear deal with Iran has been done. There is jubilation in the streets as Iran’s people, who have struggled under the weight of western sanctions for decades, are waking up to the prospect of a brighter economic future. It’s a big win for the US and a major foreign-policy success for the president, Barack Obama, and the secretary of state, John Kerry. But above all this is a triumph for Iran’s president, Hassan Rouhani. He has staked his political future on a deal that means economic salvation and paves the way for his policy of 'engagement' bringing Iran in from the geopolitical cold. So what happened? The US and its European allies, through sustained pressure as well as dialogue, secured a series of Iranian concessions to put the framework in place. If the deal is completed and all the details settled in the next three months, Washington will have restricted Iran’s nuclear programme for at least 15 years, with a system of inspections and supervision to maintain the limits and renewed sanctions if Tehran tries to break out of the commitments. How big a victory does this really represent? Last year, Iran’s supreme leader, Ali Khamenei, said that Iran must have a capability in uranium production of 190,000 separative work units by 2021. Last night, his negotiators accepted a ceiling of 5,000 SWUs until 2025. Contrary to doom-mongering from some critics, Iran had already taken its programme far from the work needed to produce a bomb. Since 2013, Tehran had either diluted most of its 20% uranium stock—which has to be enriched further to more than 90% for a nuclear weapon—to the 5% level or converted it to oxide powder and even fuel plates, which cannot be used in a military effort. The Islamic Republic had restricted itself to 40-year-old IR-1 centrifuges; the more advanced IR-2s, installed in early 2013, never went online. Still, the US and Europeans pressed with a somewhat arbitrary technical line—arbitrary because it is not based on precise measurements but a series of assumptions about capability: you must not have any prospect of 'break-out' for a single nuclear bomb within a year. They reduced their operating centrifuges by 50%—an even deeper cut than that reportedly in the draft document a month ago—and promised to hold that level for 10 years. They promised no enrichment of uranium beyond 3.67% for 15 years. They put the IR-2 models in storage, overseen by the International Atomic Energy Agency (IAEA). They promised to halt all enrichment at their second plant at Fordoo, converting it to a “research facility” but accepting no research and development “associated with enrichment”. The commitments will be overseen by IAEA inspection of all nuclear facilities. Iran committed itself to the advanced provisions of the Additional Protocol of the Non-Proliferation Treaty, bolstering the oversight of its programme. It confirmed the redesign of its Arak heavy-water reactor, to reduce plutonium by-product—and promised no other heavy-water reactors for 15 years. Even on sanctions, the reddest of Iran’s 'red lines' for a framework, the Iranians stepped back. 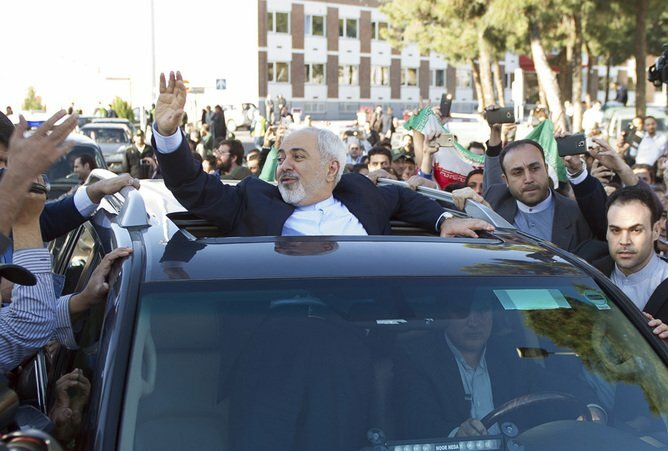 In principle, Iran’s foreign minister, Mohammad Javad Zarif, is holding up the image of suspension of all sanctions as soon as a comprehensive deal is signed. In practice, the framework ties any removal to IAEA verification of Iran’s compliance, a process which could take weeks, months or even years. Most importantly, the US and the Europeans embedded into the framework of the deal the warning of reimposition of sanctions if Iran is found in violation of any provision. US, European Union and even UN sanctions will have a 'snap-back' mechanism so they can be put back in place. Put bluntly, Zarif and Rouhani restricted Iran’s nuclear programme to save the Iranian economy. It was the threat to the economy, presented by Rouhani to the supreme leader in a dossier in September 2013, which brought Khamenei’s endorsement of renewed negotiations. It was that threat, even more menacing with the halving of oil prices since last June, which turned Iran’s declaration of an expanding nuclear programme into one with diminished output. And it was the prospect of ever-increasing unemployment, ever-decreasing production, ever-unstable currency and a government budget ccontaining a $70 billion hole which brought the further concessions leading to last night's announcement. But Rouhani may not just be thinking of survival. Instead—unseen by many outside Iran—a nuclear deal will be part of the president’s strategy to remake the Iranian economy. The president and his allies believe, with a great deal of justification, that the Islamic Republic’s economy has been crippled, not only by US-led sanctions, but by entrenched barriers to effective investment, production, infrastructure and trade. Much of this is controlled by interests linked to the Revolutionary Guards; efforts at 'privatisation' have often been facades merely extending the power of those interests. The budget and Iran’s economic fortunes are ratcheted to the state of the oil market, with non-oil production continuing to struggle. Rouhani’s hope is that he can take on those interests to open up Iran’s economy, not just to foreign investors but to those inside the country who have been unable to break the hold of more powerful factions. The Islamic Republic’s oft-proclaimed commitment to research, science and technology will finally translate into completed projects. The president had indicated that he wanted to take on this battle, notably in autumn 2013 as the nuclear talks were re-energised. But he is unable to act until the discussions are concluded. Finally, that prospect can be envisaged. To make any headway against powerful constituencies such as the Revolutionary Guards—which means enjoying the consent of the supreme leader—Rouhani has to show mass support for his economic initiatives. The celebrations in Tehran last night over the framework, despite Iran’s concessions, were a sign of that support: Iranians are putting the future of their jobs, homes and families above any supposed goal of an Iranian flag on a bomb. What will the supreme leader do? Yet, amid these unexpected developments and prospects, there has been one notable silence. Khamenei has offered no comment on the framework or the ensuing talks about the details. Indeed, his office has been silent for almost two weeks about the situation. Khamenei does not have to make his ultimate choice until June, when the final agreement is presented to him. It will be a stark choice: accept the 95% cut in Iran’s nuclear programme, compared to the goals he set out last year, or face long-term economic decline and possibly worse. With his distrust and even hatred of the US government, the supreme leader could wreck everything, rejecting the agreement and proclaiming a 'resistance economy'—with all the sacrifices this would entail for Iranians—to defy his perceived enemies. But Rouhani is gambling, as he did in September 2013, that a pragmatic Khamenei will accept the deal, even if this is his version of the “cup of poison” sipped by Ayatollah Ruhollah Khomeini, when he accepted a ceasefire in the Iran-Iraq War in 1988. That gamble will probably rest on the US and its allies refraining from any public gloating over their victory, glossing the detail of the nuclear agreement with the 'win-win' favoured by the Rouhani and Zarif. It will rest on no further threat of sanctions, letting the current restrictions and the depressed oil price do their work. And it will rest on Iranians, in defiance of their country’s hardliners, continuing to display their desire for a final resolution, so they can return a prospect of hope to their lives.